So you already know from Mom that we have a new baby in the house. I could tell something was up when Mom came home one day last week and she was all excited and said something about a kitten and then she let me smell her hands and there was kitten scent all over them. I didn’t think anything of it until she kept telling me that we were going to get a new family member. She really tried to prepare me, I’ll give her that. It’s been over a year now since my sister Buckley passed on, and I kind of liked being the only cat again and having Mom’s undivided attention. Sure, it got lonely sometimes, but Mom is home a lot, and when she’s not, I sleep most of the time anyway. But apparently Mom had made up her mind, and on Tuesday, she brought Allegra home. At first, I couldn’t believe it. I really wasn’t thrilled, and I made sure that both Mom and this new interloper knew it. I may be totally sweet most of the time, but I can hiss and growl with the best of them. Besides, I have to make sure this little whippersnapper knows who’s in charge around here! The first day, I pretty much just stayed away from Allegra, and watched her from a safe distance. If she came too close, I gave her a warning growl or hiss. A couple of times, she pushed her luck, and I had to smack her upside the head. I know Mom was upset, she knew I wasn’t happy and she hated that her decision to bring Allegra home was the reason for it. I tried to tell her that I understood she didn’t do it to upset me, I knew she couldn’t help herself, but it was not a happy day. That evening, I was relieved when Mom took me to bed with her. That’s our time together, we always snuggle at night, and I was really glad that even having a new baby in the house wasn’t going to change that. I stayed snuggled up against Mom all night long, and that felt really nice, like old times. Unfortunately, when I woke up the next morning, the little pipsqueak was still here. I hadn’t just dreamed the whole thing. The day didnt start out so great. I was minding my own business, heading down the stairs to use the litterbox downstairs hoping for some privacy when the little stinker attacked me from behind. Boy, was I mad! I swatted and hissed at her. Thankfully, the day got better as it went on. I continued to keep a close eye on her, and it was actually kind of fun to watch her get used to our house. She’s fascinated with windows. I guess I’ve gotten kind of blasé about them, taking our backyard views of birds and squirrels for granted, but I still remember what it was like when I first came here. 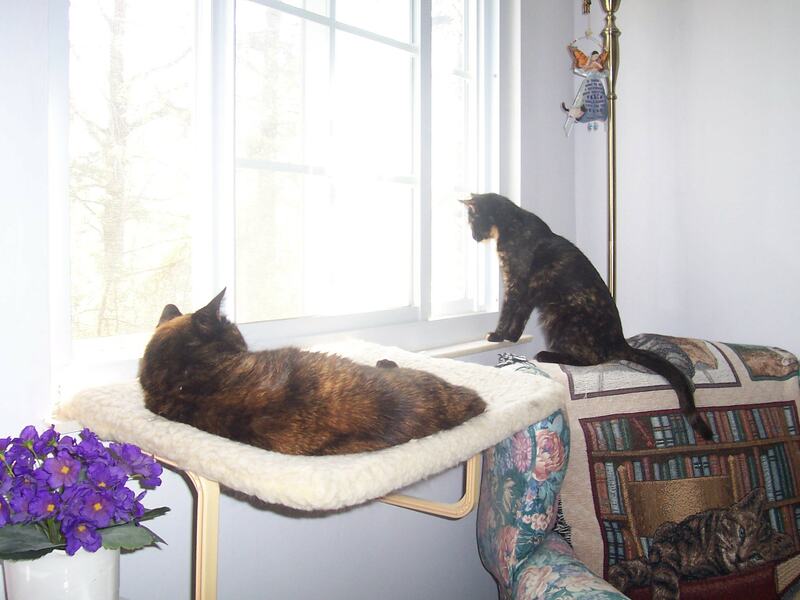 It was almost overwhelming – so many windows to look out from, so many soft places to sit, it’s hard to know where to start, and I was an adult at the time and much smarter, not a little kitten like Allegra. Anyway, I relaxed a little bit more, and as a result, I could feel Mom relaxing, too. She really worries about me, and I love her for it. 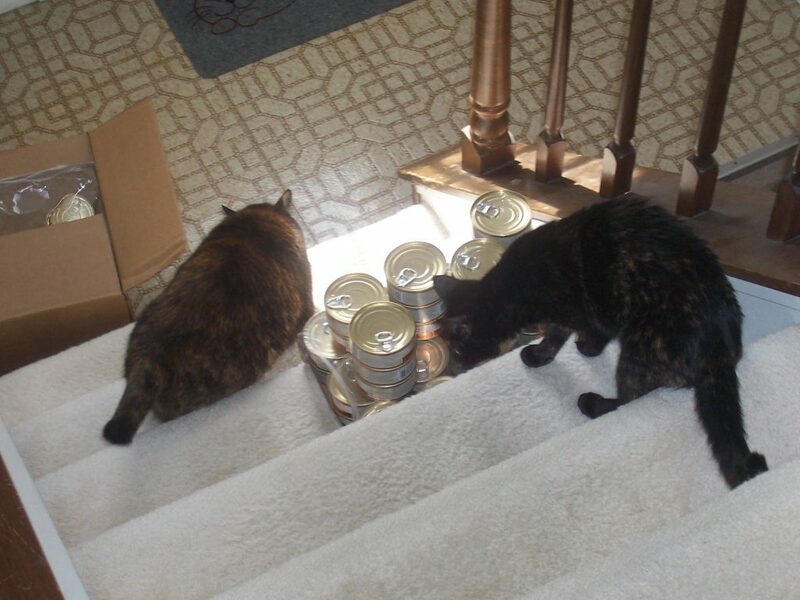 And then something really fun happened – a big box arrived, and when Mom opened it, I realized that it was filled with cans of cat food! So I had to go check it out. When Allegra joined me, it didn’t even bother me, and we both helped Mom unpack the food. Good to know that Allegra and I have that in common – we both love our food! The last two nights, Allegra even slept in our bed with us for part of the night. At first I wasn’t crazy about it, but I was safely curled up in Mom’s arms, and as long as I get to do that, all is well with my world, and I guess I can be big-hearted enough to allow this little kitten on our bed, too. It will be interesting here, now that there’s three of us again. Mom told me she’s counting on me to show Allegra the ropes, and I won’t let her down. Hi Amber, you have such a lovely story and I’m glad to see you’re at least trying to get along with your new sis. I had 2 cats but one has gone out and has not come home. I have been so sad but I am hopeful he will still make it home. 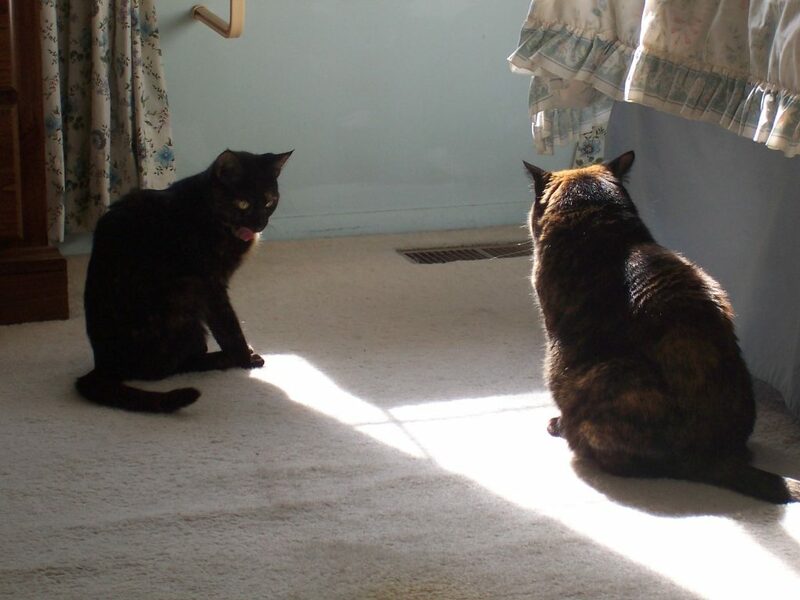 When I brought my 2nd kitty home Sirvivor wasn’t too happy either but it didn’t take long before they became fast and best friends. Both oh my kitts are recuse cats and are the best kitty’s in the world!!!! I hope your kitty comes home, Lorikay – I can’t even imagine how distressing it must be to have him missing. Knowing who’s boss is key on Amber’s training plan for Allegra, Wendy. I am sure she’ll learn quickly under your tutelage, Amber. My Parker knows all too well what it’s like to welcome a new cat into the home. I think sometimes he still misses the days when it was just him and Riley, our dog, but overall, he’s grown fond of Anya, especially since she knows whose boss. Marg, I think Amber is a little frustrated with Allegra’s short attention span. She says at this rate, training will take a long time…. Layla, Amber would rather sunggle with Domino than Allegra right now. But she is taking his wise words under consideration. Amber, your pal and long distance Lothario, Domino wants to say, “You’re doing the right thing. Show her the ropes. We learn by observing and eventually you might like her grooming you and who knows, even snuggling. No one showed me and now it’s too late. Amber we sure are glad to hear that you are teaching Allegra how to behave and to leave you alone. She will learn. We know you might even get so you kind of like her. You will always be Mom’s favorite. And remember that Allegra is young and needs training.